You are concerned that your body does not seem to be aging gracefully. The smart move is to undergo HGH deficiency testing if you are over thirty years of age. Human growth hormone may be the body’s MVP – most vital product. As a chemical messenger, this hormone cannot be beat for the many functions it helps regulate. That is why testing your HGH levels for a deficiency is crucial if you suffer from any of the symptoms of growth hormone deficiency. Energy, cell regeneration, metabolism, immunity, brain functions, libido, and heart health all rely on HGH every day. If you are tired, do not sleep well, or always seem to be catching another cold, you might have low HGH levels. The same holds true if your skin is aging, your hair is thinning, or your memory is fading. The growth hormone deficiency testing process begins with you contacting a hormone specialist. You want a doctor with an extensive background in balancing hormone levels. What Does HGH Deficiency Testing Include? The growth hormone deficiency diagnostic test starts out with a confidential medical consultation to discuss your symptoms and concerns. Step 2 is visiting a local laboratory to have a blood specimen collected for testing. You will also go to a local doctor for a physical examination. There are options for completing this step, and your hormone advisor will discuss them with you to simplify the process. Since the hormone specialist is not familiar with your medical history, you will complete an intake questionnaire that details your current and prior concerns, illnesses, and treatments. Once you complete these HGH deficiency testing steps, the hormone specialist reviews the results. The next step is a determination of treatment options. Does the Doctor Check Anything Else Besides HGH Levels? When checking blood levels, the doctor will order more than just an IGF-1 test. Insulin growth factor 1 measures how much IGF-1 is in the bloodstream. IGF-1 is the indicator for HGH because its secretion by the liver is in direct proportion to how much HGH the pituitary gland secretes. Why do doctors not check HGH levels for GH deficiency testing? Human growth hormone does not hang around in the bloodstream like many other hormones. Once secreted in a pulsatile burst, HGH races to its receptor cells before exiting the bloodstream. 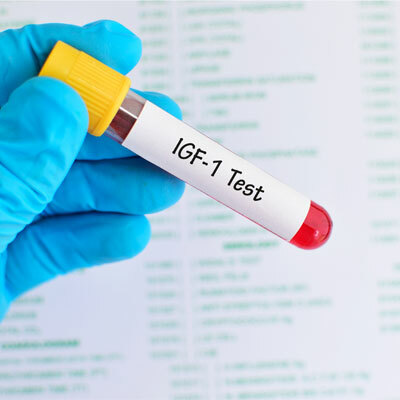 Since IGF-1 levels remain relatively steady, it becomes the better marker of HGH deficiency. CBC – the complete blood count checks for anemia, blood cell count, leukemia, infection, inflammation, and more. How Quickly Do You Get the Results of HGH Deficiency Testing? Your growth hormone deficiency test results take only a few days after you visit the lab for your specimen collection. The results will come directly to our hormone clinic for the doctor to review. We provide you with the findings after you have completed all diagnostic steps, including the physical examination. The doctor requires all results before he or she can make an accurate diagnosis of growth hormone deficiency. HGH deficiency testing will let you know if human growth hormone therapy can benefit you. What Happens If HGH Deficiency Testing Is Positive? Getting a positive diagnosis of HGH deficiency is a good thing. Why would you want to hear that you have a problem? Truthfully, you already know that something is not right in your body. Getting a direct answer solves the mystery. HGH deficiency is not a serious issue, and it is easily treated. Of course, if you ignore your hormonal imbalance, it will only worsen, and that can lead to other problems. The lower your growth hormone deficiency levels, the more crucial it is that you receive treatment. Left unchecked, HGH decline can increase the risks of osteoporosis, cardiovascular disease, dementia, type 2 diabetes, obesity, and other health concerns. Positive HGH deficiency testing results in a prescription for human growth hormone therapy that reverses your symptoms and improves your quality of life. To learn more, please contact our hormone clinic for your complimentary consultation.